For the most professional and affordable roof cleaning service in Lugoff, go with Clean Finish! We are the area’s leading pressure washing and roof cleaning provider, with unbeatable expertise, experience, and professionalism that will get your roof to a clean finish in no time! Cleaning a roof is very hard and dangerous work, and it is definitely something that you will want to leave to the professionals like us at Clean Finish. Your roof is a very expensive part of your home, and so maintaining it is a necessity if you want to avoid expensive repairs. 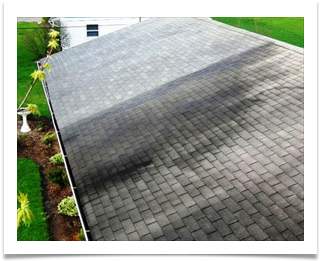 Our roof cleaning system completely removes and kills all mold, mildew, grime, and dirt, leaving your roof with a brilliant new shine looking very fresh and clean. Our services not only improve the look of your roof, but it can help with improving your health, too. All of that mold and mildew covering your roof can easily make you sick, so you can avoid that by taking advantage of our affordable and professional services. You can be rest assured you are working with a fully professional company dedicated to your complete satisfaction when you work with us. We show up on time, have professional equipment, take our responsibilities seriously, and are fully insured and protected against any accidents that might happen. Give Clean Finish a call today to get started on your Lugoff roof cleaning! Call 803-229-2732 now!